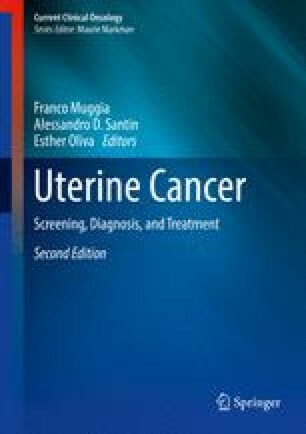 Due to its documented efficacy in improving locoregional control and reducing rates of vaginal vault recurrence, radiation therapy has been used as an adjunct to surgical intervention for the last 5 decades. Several randomized studies have established the role of adjuvant radiotherapy in decreasing local recurrence among patients at intermediate to high risk of local failure. External beam radiotherapy achieves local control at the cost of some morbidity but does not influence overall survival. Intracavitary brachytherapy has emerged as an alternative to external beam radiotherapy due to its overall lower morbidity. Trials are ongoing to determine the potential added benefit of chemotherapy to radiation therapy as well as to explore lower brachytherapy doses in early stage disease. For management of high risk, more advanced stage disease and carcinosarcoma, please see Chaps. 10, 11, and 13, respectively.